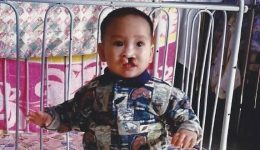 Home / Articles tagged with "Dr. Jordan Steinberg"
Articles for Tag: "Dr. Jordan Steinberg"
Trey Figatner has had seven surgeries to repair a cleft lip and palate. At age 17, for the very first time, this teen likes what he sees in the mirror. The 10-month-old from Ivory Coast, Africa, is recovering after a complex surgery in Park Ridge, Ill., to remove her parasitic twin.